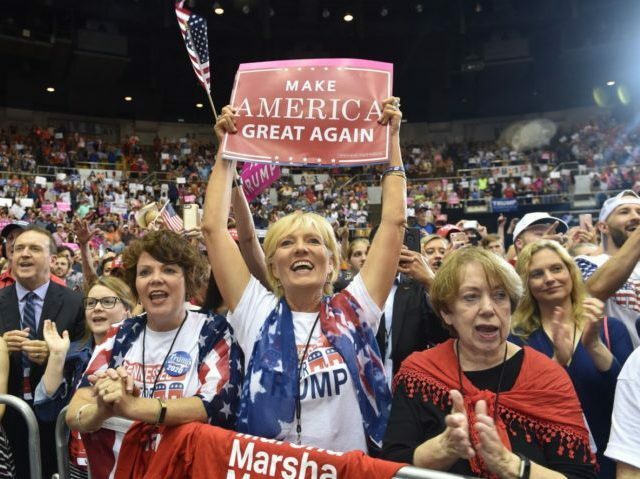 The Democratic Party’s advantage among American women suffered a six percentage point swing over the past year, according to a Gallup poll released Monday. Women are still more likely to view the Democrats favorably than they are Republicans, but the difference has contracted. A year ago, 35 percent of women said they viewed Republicans favorably. Democrats had a 14 point advantage, with 49 percent viewing the party favorably. In the latest poll, the GOP favorability rating rose to 40 percent. The Democrat favorability fell by one point. That leaves Democrats with just an 8 point advantage. Democrats have completely lost their advantage with American men. A year ago, 40 percent of men viewed the Democrats favorably, while just 37 percent viewed the GOP favorably. Now Republicans are in favor with 50 percent of men. Favorability toward Democrats climbed one point to 41 percent, giving the Republicans a 9 point advantage. Republicans also now enjoy an advantage with middle-class voters. A year ago, Democrats led Republicans 46 to 36 among voters earning $30,000 and $74,999 annual. Now Republicans have the lead, 49 to 45. The Democrats still lead, however, among low-income Americans and the wealthy. But even here the advantage is smaller. Among low-income Americans, Democrats now enjoy an 11 point advantage versus 12 percent a year ago. Among wealthy Americans, the Democrat advantage has contracted to 7 points from 10.